Finding hope can be hard. Keeping hope alive can be harder. We watch the news in horror far too often. We struggle with personal problems and fears. For some those struggles are like the occasional thunderstorm, for some they are like a relentless rain. Our minds are continually engaged with the reality of suffering, whether of others or our own. If we have any awareness of history, we know that human suffering is not new to any generation. The first family in the Bible experienced a domestic murder, and it has never ceased. People hurt others and themselves. So much dysfunction. So much brokenness. Yet even when we get a lull from the carnage blowing up our Twitter feed, we still struggle in daily life with the lack of resources, addictions, abuse, relational dysfunction and the material and social gap between the rich and poor. And we can lose hope. But what is hope exactly? Hope is a feeling. It is a good feeling coming from the expectation of good things to come. It is a feeling that has the ability to redirect discouragement as merely a temporary setback, and it will not give in to despair. It causes us to be resilient. But it is also more than this. Beyond the feeling, which can fluctuate greatly, it is a confidence of good things to come in spite of hurt, disappointment, loss, lack, and pain. It is a confidence that can persist even when material life is uncertain or even disastrous. Hope as a feeling and a confidence is always founded on something. And our hope is only as strong as that source. So, the question is this: What am I resting my hope on? Is it the government? Is it my family? Is it my own strength and ability? Is it my savings account, pension or 401K? And what happens when my source of hope suddenly falls apart? In a Christian worldview hope is built on the revealed truth that our existence is credited to our Creator, who purposed a design for our lives. At the heart of this design is our purpose to know God and find our satisfaction in Him now and forever. Furthermore, this purpose is only to be discovered and realized through faith in Jesus Christ. Yet the human brokenness around us and in our own lives causes us often to lose hope. But in those moments our search for hope can lead us to the right source. Hardship can be the catalyst for embracing the truth and hope of the gospel of Jesus Christ. Or, that same hardship can lead us down a path of self destruction and despair. According to the Bible, our brokenness is the result of sin. And sin is the willful disobedience of God's commands. God has revealed that this reality of sin has impacted all creation. Sin has corrupted God's original design, including every person's heart, mind and will. Yet, Jesus is about recovering that original design. Through him death was conquered and a way was made to have forgiveness of sin and favor with God. This is the good news that gives a confident hope in our lives. If you're tired of the brokenness in your life - whatever that may be - then consider what God has revealed in Jesus and His Word. You may be trying to do your best, yet on the inside you feel the hopelessness. It's easy to try to find purpose and hope in material things and in relationships. And for a while it seems to work. But in the end, only confidently knowing that all is right with the One who created you will give you true and lasting peace, contentment and hope. If you're ready to embrace the hope that is in the gospel of Jesus Christ, talk to someone you know who believes this. This Sunday, go to a worship service where you know the message of Jesus will be explained and where you will have the opportunity to respond. And you will find hope and so much more. October 31, will mark the 500th anniversary of what historians have overwhelmingly agreed as the event that launched the formal beginning of what we call the Reformation. At the center of the controversial movement was an obscure Augustinian monk in an insignificant German town whose search for peace with God drove him to scripture and his frustration with exploitation compelled him to activism. Both quests set him on a collision course with the established norms and authority of the Roman Catholic Church. 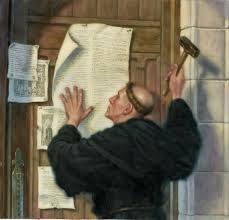 The Reformation was, of course, the birth of Protestantism, which manifested itself in various forms in short time. It was also a revolt against the religious establishment which many considered corrupt in teaching and practice. This conflict was intense, fracturing western civilization within its religious, political and social spheres. Because of the wedding of state and church in sixteenth-century Europe, bloody conflict between states and within their own citizenry resulted. Now, 500 years later the hostilities have long since ceased. Catholics and Protestants are no longer at each other's throats. In modern western civilization, we now cherish individual freedom in regards to matters of religion. We have effectively compartmentalized government and religion so to keep them out of each other's business, even if occasionally we find ourselves debating which has the proper jurisdiction on a certain issue. 500 years seems to separate two worlds completely foreign to one another. Those of the sixteenth-century could not have imagined such individual freedom and the toleration of certain beliefs and behaviors today. Conversely, we can't imagine people literally killing each other over what we would consider religious issues. Because of this stark contrast between then and now it may be natural to wonder why the Reformation should matter to us today. Why celebrate it? Among all the complexities of the Reformation - within all its triumphs and tragedies - two key aspects of its significance for faith stand tall. These two matters still need our historical appreciation and current attention and application. The Reformation offered revolutionary answers for two vital questions: How do I know what I should know about God? And, what must I do to have favor with God? The reformers' answers to these turned the common notions upside down and ignited a true spiritual awakening. The first reason the Reformation still matters – the reformers boldly established the Bible as the supreme authority for the church. The Roman Catholic Church asserted that three sources of authority worked together - the Bible, the papacy, and the official laws and customs of the church. In theory these three sources of authority worked harmoniously together. In reality, educated men, like Martin Luther, saw clearly where popes and councils and scripture had often contradicted one another. The reformers defied the powers in charge and declared that for matters of faith that the Bible alone was authoritative. It was no longer a matter of what the church hierarchy declared to be true, but whether doctrine and practice was upheld by the clear teaching of the Bible. Protestants shifted their allegiance to scripture and away from institution. This continues to be of vital importance for us today. Our culture suffers from the church’s a lack of biblical authority. Individualism rules the day and our own personal right to our opinion is often our most sacred treasure, even in the church. Our intellectual default is to respect each other's opinions, which sounds reasonable, tolerant, and enlightened. However, it's pure nonsense if our goal is to know truth. Truth by nature is specific and absolute, not subject to my opinion. I am subject to it. We have no problems with this when it comes to subjects like math or physics. However, many push back at the notion of an absolute religious truth to which we must submit, especially in matters of morality. The Reformers took Christians back to the Bible as the authority for matters of faith. The Word of God would no longer be subject to the control of the church; it would be unleashed so it would dictate to the church the truth of God. Today, we need to be grateful for this rediscovery of proper authority for the church and for every individual Christian. This still matters today. The second reason the Reformation still matters - the reformers, through the Bible, recaptured a biblical understanding of how each of us can have forgiveness and the favor of God. This understanding became captured in the phrase justification by faith alone. In other words, personal salvation was not the result of earned merit through a sacramental system of religious works and observances. The Roman Catholic Church had conditioned people to think of salvation as doing. Protestants seized upon the biblical truth that salvation was about believing after which came the doing. Salvation was through grace through faith solely based on the merits of Christ. Today, this still must be repeated over and over because human nature continues to want to earn God's favor. Martin Luther found himself desperately seeking to accomplish various aspects of devotion in acts of penance and spiritual disciplines. However, he never achieved peace in his soul, but only became more aware of is own hopeless sinful condition. Only when he was enlightened to the truth of the Bible - that the just shall live by faith - did he finally encounter the truth that brought spiritual transformation and satisfaction for the soul. We must never lose sight of the biblical truth for each man and woman. Reconciliation with God comes through Christ alone, by grace alone, through faith alone. Our relationship with our Creator is not based on what we can bring and offer to Him; it is dependent on faith in the person and work of Jesus Christ. And if that faith is real, then it follows Him, loves Him and keeps His commandments. This still matters today. The Reformation is not dry, dusty irrelevant history. What we wrestle with today in regards to questions of authority and how we have favor with God is exactly what they were wrestling with then. Their voices still speak loudly to these matters to which we need greater clarity and stronger conviction. We would be wise to renew our commitment to that which they sacrificed so much. I've recently arrived at what was an "ah ha" moment, but it probably should have been obvious to me after all these years in ministry. Here it is: Sunday morning worship is the beginning of the believer's progress in true Christian discipleship and the foundation for wanting to share the Gospel. If a Christian doesn't have a commitment to gathering weekly for worship with his church family, he will neither progress to a more mature discipleship nor to sharing his faith with others. A commitment to weekly worship is how a believer can first demonstrate that she is truly following Jesus. One might object here and say, "I don't have to go to church to be a Christian!" I wouldn't technically argue with that. But I would have to question the maturity of a Christian who wants to defend that statement. If you're a nominal worship attender, let me ask you a couple of questions. Are you truly growing as a disciple of Jesus by growing in the Word of God and learning to live a more God-honoring lifestyle? Are you sharing your faith with others? I would guess the honest answer would be "no" to both. Here's the point: If we want to be engaged in real, life-transforming growth as followers of Christ, we can't reach that with a half-hearted commitment to weekly worship. Gathering consistently for worship is the foundation for a natural progression of spiritual growth. We must have an intention to be regularly present. And when we are present we must nurture our attention to be on God's worth and the welfare of others around us. When we come to worship with spiritual focus, we become active participants rather than passive spectators. We learn to be God focused and less me focused. We share in exalting Christ. We practice being Spirit-filled and tuning into what God speaks into our lives through the preaching and singing of His Word. I believe until we do this regularly, we will have little desire to grow in faith or share Jesus with others. Of course, simply warming a seat each week out of a sense of duty or tradition won't really do it either. However, authentic, personal worship in a corporate setting is the catalyst that causes us to want to grow in faith and share the Gospel. Anyone I know who seeks deeper discipleship and takes the time to be involved in outreach programs is already a faithful attender of weekly worship. But I have never observed a half-time or less worship attender faithful to small group discipleship or outreach efforts. Now, listen to what I'm actually saying. I'm not saying you can't be a genuine Christian and be uncommitted to Sunday worship. And I recognized some people have careers that may require their presence on some Sundays. But if you can choose to be in worship most of the time, but don't, you will not progress in your relationship with Christ like you could. It's just not going to happen. Let me tell you why. Jesus said that the one who wanted to follow him had to "deny self, take up his cross daily, and follow" (Luke 9:23). This following is a first-priority commitment to make myself second to Jesus - period. If I can't begin to follow Jesus by making Sunday worship a priority, then how will I successfully follow Him in stuff that takes even greater commitment? Furthermore, worship takes practice to get it right. That may sound strange, but think about it. We have to learn what worship is, what we're doing, and why we're doing it. It takes practice to get all that straight in our minds and hearts and get dialed into what worship really is and what it is not. If we are absent most of the time, then we can't get better at it. This is why it's critical that pastors teach the congregation these things and that those leading worship have a sound, biblical understanding. Gimmicked up worship leads people's minds, hearts and emotions in the wrong direction to the wrong things. The purpose of corporate worship is to declare God's greatness and goodness to God Himself, to each other, and to unbelievers among us. And when we do this God receives glory, we are strengthened and the lost are draw to Christ. When we learn to worship, we essentially tune ourselves spiritually to make more of God and less of ourselves. We begin to hunger more for His Word, have a deep sense of gratitude for grace, and delight in His beauty. We learn to trust Him more and find our greatest satisfaction in our relationship to God through Christ. Only when this begins to happen will a desire arise in us to pursue God with deeper discipleship in small groups, personal Bible study, prayer, service, and consistent giving. Only when we worship will we develop a passion for the Gospel that will compel us to be trained to share our faith more effectively. The fact will always remain that Jesus called us to follow Him with our whole lives. He said, "No one who puts his hand to the plow and looks back is fit for the kingdom of God" (Luke 9:62). The point again is real commitment. Jesus made it clear that loyalty divided is no true loyalty at all. We can't say we follow Him and at the same time gaze longingly back for this world. It's an all-in commitment. It's us who think we can make that commitment less than He made it and still think it's a real commitment. If we desire a satisfying relationship with Christ, then we have to be all in, whatever that means and whatever that costs. This pursuit is a life-long endeavor. No one ever arrives. However, a simple way to progress spiritually is to shift priorities away from all those activities that consistently displace worship to a serious commitment to gathering for worship. This is the prerequisite for nurturing a desire to grow as a disciple and becoming an effective witness for Christ. If your enthusiasm for Christ isn't what you think it should be, then I would challenge you to be honest about your attitude concerning corporate worship. If it truly doesn't constitute a firm priority for you, then I would suggest there is a direct connection between your level of dissatisfaction and your absence from worship. Maybe you would take the following challenge. Make a six month commitment to make weekly worship your greatest commitment for Sundays. If at all possible, choose to put it first and don't allow other things to take you away from it. Come with the attitude of submitting yourself to God, listening attentively to the preaching of God's Word, and participating enthusiastically. Don't expect it to be perfect, but expect God to work in your life. Don't expect your spirit necessarily to soar immediately, but do expect change to emerge. If you do this, don't be surprised if God doesn't whet your appetite and give you a desire to want to get closer to Him, more involved in your church, and a burden for those who need to love Jesus the way you will. We wrongly use the word church. And it keeps us stuck in unbiblical and unhealthy mindsets in regards to what the church is and what it does. We need to kill the modern usage of the English word church. First, just a little bit of history of the English word church. The word comes down to us from the Greek, kyriakos, which means "from the Lord" or "pertaining to the Lord" The actual Greek word in the New Testament that references a gathering of Christian believers is ekklesia, which literally means, "an assembly of people." This begs the question of how the English word church, which does not mean an assembly of people came to be used as a translation for ekklesia. I suppose it's difficult to know with certainty how this happened, but it appears that some of the first English translations, such as Tyndale's (1526) and Coverdale's (1535) used the English word congregation, rather than church. However, the popular Geneva Bible (1560) and then the King James Bible (1611) used the word church. Such an obvious mistranslation strongly implies that a pretty strong agenda lay behind it. The best explanation seems to be that the word church was better for emphasizing establishment. The church was the institution whose existence and purpose was to be understood as "pertaining to the Lord." What this ambiguous and confusing label did was lend itself more to an institutional and authoritarian sense, rather than the original sense of a gathered assembly of people. Unfortunately, it became common place in English, and translators since the KJV have been stuck with it. The consequence of this has been profound. Today, we use the word to mean just about everything but what the New Testament word ekklesia actually means. Today, when you hear the word church being used it is typically an unbiblical usage. Most often people use it to reference the organization and it's location. If someone asks, "Where is First Baptist Church?" another will answer, "It's on Main Street," referring to a building that is empty most of the time. Often you'll hear a church being referred to as "pastor Smith's church," as if it is the business that he runs. Then you'll hear many ask, "where do you go to church?" This usage has a double meaning. Such a question reveals that the one who asks it thinks of church in the framework of a meeting that happens in a certain place by a certain religious organization. Going to church means attending worship service. We even say, "It's time to go to church." In this way, church is conceived as something you attend. Of course, the word church is also conflated with all our denominational labels - the Baptist church, the Presbyterian church, the Pentecostal church, the Methodist church, the non-denominational church, or the community church. Again, this reinforces the idea of institution because now we have to ask, "What kind of church?" I'm so confused! How about you? The word has come to be used in so many ways that it really doesn't mean much at all. It typically is used in ways that only reinforce the wrong ideas. This reality has left us with many unhealthy misunderstandings, which have been embedded into many bad practices. Words, in the end, really do matter. The Greek word in the New Testament for what we call church, ekklesia, was a common term used primarily in regards to a called out group of people for a specific task, usually in regards to civil and public service. But in its basic sense, the word just referred to a group of people congregating together for some purpose. Jesus is recorded using the word ekklesia twice. In Matthew 16:18, Jesus declares, "...I will build my church..." Jesus was simply saying He would gather and build a people for Himself, an ekklesia, not an institution or a campus. In Matthew 18:17, Jesus uses the word in the context of the church exercising church discipline. The last step of attempting to correct a wayward brother is to tell the matter "to the church." In other words, get the whole congregation in the know and involved. In Acts and the letters of the New Testament, the word church is typically used in reference to a group of Christians in a certain location. However, there is also a sense of a universal church that spans the ages and will be fully realized at Christ's second coming. In either sense, the meaning of the word church (ekklesia) is a gathering of people with a shared purpose. The Christian movement used a common Greek word in a new way. Jesus called what He was building a "called out assembly of people" that would follow Him. The early church clearly understood this. However, once the church became an institution, patterned after the Roman Empire in the fourth century, this meaning began to be lost. By the time we get to English translations of the Bible in the sixteenth and seventeenth centuries, we see this institutionalization embedded in the mindset of translators. A few astute individuals, like Tyndale translated ekklesia with the English word congregation - which is a much better word! Regrettably, establishment mentality won out in the end and English translations established the word church. What to do? I think we must shift our understanding and our usage of the word church. For example, when referring to the building where the church gathers for various activities, let's use a term like meeting house. When we are referring to the time of gathering for corporate worship, then let's be mindful to use the word worship. And when we are really talking about the people who make up the church, then lets use the term congregation. It's more than just words. Words shape and reinforce our understanding. If we can train up a new generation to use these words biblically and accurately, then we may be able to reverse some of the institutionalized, corporate, entertainment driven "church" mentality that pervades evangelical Christianity today. Sometimes hurt we experience is deep and traumatic and feels like a continual open wound. Sometimes the hurt is sharp and temporarily difficult, soon healing up but never completely forgotten, leaving a scar. 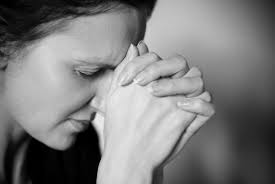 Our collective struggles are many - abuse, relationship ruptures, failures, addictions, hopelessness, sickness, tragedy and losses of various kinds. Sometimes we think to ourselves, "How can I overcome THIS?" We have a hard time envisioning a future that doesn't include this pain. And when we let this pain begin to define us, then we tend to spiral down into deepening pain or even self-destructive behavior. Of course, we don't want this for ourselves, but we just feel stuck. The Christian faith is not an abstract system of theological propositions with moral expectations. It is a faith that completely connects with our human experiences. Christianity is not a set of rules and regulations; it is about faith, love and hope that gives joyful motivation to follow God's standards and principles. The Christian faith, when lived out, is practical for living. When we embrace it fully and faithfully, we discover that we encounter a power that can overcome life's greatest hurts. A genuine Christian faith profoundly helps us handle life's great challenges and pain. God brings us into a faith relationship with Himself for His own glory and for our great spiritual benefit. Here is what I believe God has revealed in His Word and proves over and over in the lives of believers. These are reasons you can know that you can overcome THIS! I know that I can overcome THIS because God puts an unshakable faith within me. Jesus told us that those who hear His words and acts on them will be like a man who built his house on a rock. And when the storm comes and beats against the house, it will stand (Matt. 7). We have a firm footing when we are confident that Jesus is the Son of God, who has revealed Himself to be our Savior and Lord. We may bend, but God will not allow us to break. When our hurt is too intense and deep for words, the Holy Spirit makes intercession on our behalf. And because this is true, we can be assured that God is accomplishing his purposes and He will work good even in spite of the bad (Rom. 8). This unshakable faith is not in our own strength. This is a faith that comes from a genuine change that comes through, what Jesus called, the new birth. Jesus explained that a true relationship with God is only possible by being born again of the Spirit (John 3). Being born is something that happens to us. We don't cause our spiritual birth any more than we caused our physical birth. God calls us to believe and follow, but we rest assured that we didn't save ourselves by our own strength or goodness. He did that. And since He made us new people by His Spirit, then he will sustain us. Jesus said clearly that His sheep know Him, follow Him and that He will never lose any of them (John 10). Our hurts are sometimes pretty awful, but if we are in Christ, we must remember that He holds us all the while. He causes us to persevere. I know that I can overcome THIS because God gives me a family of faith that strengthens me. For us to willingly divorce ourselves from a meaningful relationship to Christ's church is to remove a God-given, burden-bearing, support system from our lives. The church is the body of Christ and every believer should share in it and benefit from it (Rom. 12; 1 Cor. 12) . The New Testament witness knows nothing of lone-ranger Christians. Jesus established his church for those who would believe and follow. In faithful service to God, every born-again believer should be participating in a local church that faithfully teaches the Word of God. When God saves us we become part of His church to further the Gospel. Additionally, He provides us with people who can lighten burdens and minister to us in our times of hurt (Gal. 6). The church is certainly bigger than me, but it includes me. Not only do I get give and serve, I also get to receive help in my time of need. If we are in a compassionate church (which most are), we need to remember that those people are God-appointed medicine for our hurting soul. They cannot take away pain, but they can help make it more bearable. They can embrace us and "weep when we weep" (Rom. 12). There is tremendous strength to be found in community. If we are connected, serving, giving, worshiping, and growing side-by-side with other believers in the church, then when the hurt comes these friends of the faith will be there for us. I know that I can overcome THIS because God gives me a future that sustains me. Our faith in Jesus continually gives us a bigger picture that encapsulates our present hurt. We shouldn't deny the hurt, but we have the ability to put it in a bigger perspective that is infused with hope that comes from our faith. This ability comes from the presence of real hope. This is not merely wishing for a brighter future; it is knowing it. The big-picture, larger-than-any-hurt hope is the resurrection of Jesus. Jesus said that the one who hears Him and believes has eternal life and has passed from death to life (John 5). This is a present reality. We have life in Him now and will continue to have it for eternity! This truth does not change with our circumstances; it remains the constant even in our painful experiences. Jesus also told us that in this world we would have trouble, but to never forget that He has already overcome it (John 16). And because He has already secured the victory over death, so have we. We can't forget this truth of our identity in Christ! It will sustain us through the most difficult pain and loss. So, if you find yourself wondering how you can possibly get through your current pain, remind yourself of who you are and what you have in Christ. Lean on your church family; don't withdraw. Allow the grace of God to continue to do its work. Keep believing and trusting with boldness. We all are going to accumulate a portion of suffering in this life, but as believers we know who loves us, holds us, and never lets us go. Hold tight to the hand that's holding you. We all know that in church work that our purpose is defined by the Great Commission. We know that making disciples is what Jesus has called us to do, which starts with the evangelization of those who do not know him. This past Sunday in my "sermon is a sack" time with the younger kids my goal was to help them appreciate how much God loves and seeks those who are lost. I asked the group gathered on the steps of the stage if they understood what it meant when the Bible referred to a person as lost, or when we sang songs that referred to being lost. A seven-year-old girl spoke up and said, "Those are people who are running from God." My heart leaped. Perfect. We know the right answer, but we also know if we are honest, that we have a tendency to make church about everything but seeking the lost. We get preoccupied with either matters of corporate institutionalization or individual consumerism. It seems that as a church progresses over a longer period of time, it will turn inward toward maintaining the status quo and preserving the institution. Programs that have existed for a long time become ends unto themselves, and the goal is simply to keep the organization afloat and financially solvent. And as long as this is achieved we believe that the church is healthy, even if none of it truly involves any real effectiveness in reaching the lost. This is when the deacons or elders along with the pastors fall into seeing their role as managing the institution instead of leading people to be on mission. On the individual level, people have come overwhelmingly to see a church as something that serves them. They want their church to be a good, comfortable fit for them and their family. They size up its amenities (the preaching, the music, the children and youth programs, the facilities, the small group experiences, the kind of people who go there, etc. ), deciding if the church serves them well. And we have bought into this. We become preoccupied with making people happy. We should strive for excellent worship and great discipleship opportunities, but we shouldn't be doing what we do to sell people on our church. But let's be honest, that's exactly how we are thinking about it much of the time. The biblical truth is that God wants us to go and seek the lost as our primary passion. Our joy should be to put lost people at the top of our priorities. This was the passion Jesus expressed to his disciples after conversing with the Samaritan woman at the well. The soul satisfaction of doing the Father's will in seeking the lost and revealing himself was his spiritual food. 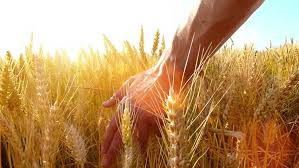 He told his disciples to lift up their eyes and look at the harvest already ripe. He pushed them out of their comfort zone and instilled in them a sense of urgency in regards to the lost. We must stop exhausting ourselves running after disgruntled or absentee church members, and use that energy to go after the lost and unchurched no matter who they are in our community. Jesus told a parable of one who invited certain people to a big dinner. All those he originally invited gave some lame excuses of why they couldn't come when the time approached. The man (representing God) grew angry at their response and instructed his servant to go out and invite the unexpected ones - "the poor, crippled, blind and lame." He would waste no more time on those who had been invited and refused. There were always others who would respond. If the lost are running from God - and they are - then we have to be running in the same direction after them. We need to run along side them, confront them with the gospel and compel them to follow Christ. We know that they will not all come when invited, but we are promised that some will. God calls the church to go after the lost. Jesus did this and taught us that this should be our passion too. If the church is truly going to be the church, then we are going to have to get a whole lot more comfortable with being uncomfortable. We must allow God to break our hearts for the lost, and trust God to use us to bring the same Good News that came to us to others who don’t know yet that they even need it. I grew up watching reruns of the original Star Trek from the late 60s. I was immediately hooked! I was delighted when The Next Generation came along in the late 80s when I was an older teen. The further spin-offs didn't really get me all that charged up. But I still enjoy the movies even now. I've had a natural attraction to science fiction and Star Trek certainly helped pioneer and popularize the genre on the small screen. Although it went over my head when I was young, the Star Trek universe was built on a vision of a 24th century humanistic worldview with plenty of 20th century social commentary. It was not overtly hostile to theism; it simply preferred humanism. In the Star Trek universe humanity was bettering itself through technology and good will - nothing more. The Star Trek fantasy world may have foreshadowed some technologies, like smart devices and talking computers, but I think it missed the mark in regards to human nature. As we have watched advances in technology improve the physical human condition, I believe we have also experienced an erosion of a Christian worldview that has been detrimental to our American culture. 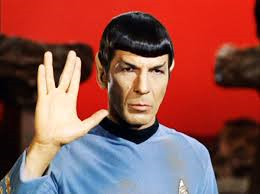 Mr. Spock's customary salutation, "live long and prosper", prompts me to ask this: Just because we are living longer, are we truly prospering? It seems to me that we are more adrift in moral relativism than ever while steadily rejecting the divine design of human relationships and being. We've taken much of what God declares good and turned it on its head and celebrated our liberation. And as we continue on this course, it appears we are losing a strong sense of purpose and significance. Pragmatism is the mode of operation. Expediency is the deciding factor. Pleasure and comfort are the chief goals. Individualism is god. We have technology that connects us unlike any time in human history and has made us more prosperous, healthier, and more comfortable in general. And like an adolescent rebelliously pushing his parents' boundaries, we seem to be telling our Creator to take a hike, while saying to Him, "we've got this now." However, the more people claim that the time has passed for the Christian faith and the church, the more I'm convinced that the church is more imperative than ever. People will find convenience and comfort in technology, but they will not find hope. People will live longer and many will have a better physical quality of life because of scientific advances, but they will not find purpose and meaning in that improved physical life. And everyone will still die one way or another. Technology has made us more comfortable, but it has not made us better like the fantasy world of Star Trek imagined. If anything, all of our gadgets and widgets have turned us more inward, led us to be hyper critical, created more confusion, and made us less trusting, more cynical, more desensitized, more indulging, and more selfish. We have come to feel less dependent on God and terribly preoccupied with self. We have become our own little gods. But here is the rub for me as a Christian and a pastor: the more the culture moves away from God the more distinct, vibrant, and caring the church must be. These are the imperative qualities the church has always been entrusted with and must not surrender now through either capitulation or complacency. The church must not shrink from declaring the full content of God's Word on any given issue and proclaim the Gospel of Jesus Christ with clarity, conviction and consistency. It is this distinctive message coming from a distinct revelation that defines Christianity. A so-called Christianity not driven by the Word of God is not Christianity. The church must have a joy and vibrancy that is evident to any who care to observe. People should see undeniable, authentic families of faith living lifestyles conforming to the instruction of the Word of God. And even if they don't like what we proclaim and affirm, they cannot legitimately question our love for one another and them. The church must be observed touching people in the community. People of faith must be engaged with the hurting and the most vulnerable among us, leveraging resources and finding ways to relieve pain and suffering while sharing the Gospel. And this caring must be done with an unselfish love. Jesus told His followers to be light in the darkness. And I think the spiritual darkness is growing darker in America. He told us also to be salt in a spiritually and morally flavorless world. And he warned us not to be contaminated and become useless. But it typically does little good to point out the darkness to people who love the darkness. America needs a positive and faithful church now that declares the truth of God's Word and provides real hope in a high tech but spiritually dark culture. People need to see the contrast of light and darkness. They need to be able to compare the fruit of the Holy Spirit with the fruit of ungodliness. A great opportunity to be a faithful witness stands before the church in this generation. Will we be faithful? Will you walk with integrity before the Lord and obey His Word? Will you make a difference in the ministry of your church through your participation? Will you seek ways to bring the hope of the Gospel to those around you? Will you be light in the darkness? Or, will you be caught thumbing your smart phone, making that all-important status update, while desensitized to God's standards and the people in the flesh right next to you? The greatest mission has always been and will continue to be to point people to Christ, who can provide them with peace with God, a purpose for their existence, and a real hope for now and eternity. The Star Trek worldview or any humanistic version of it can't provide soul satisfaction because it's presumption of the goodness of human nature is the true fantasy. Technology can improve the human physical condition, but it will never change the reality of human depravity and the need for reconciliation with our Creator. We'll just find ways to exploit technology with more sin. Only the Gospel of Jesus Christ provides our deepest and greatest need in any century. Who knows where technology and advances will take us next? That still fires up my imagination. However, we know the need for the Gospel for people's souls will remain the constant and the most important thing. Let's go boldly into our darkening culture with the light of the Gospel unashamed and unapologetic. Expect some push back, but also expect a harvest of souls and the satisfaction of honoring God and being on a mission with eternal significance. Today I saw your empty seat as I stood to welcome the people to worship. I wondered to myself what it was this week that had kept you away once again from gathering with other believers on the Lord’s Day. I love being your pastor, but I must admit that I experience sadness every time I see your empty seat. I visit the older members of our church in their homes because age and sickness has taken from them their independence and mobility. They long to be able to do what you so easily seem to give up most Sundays. I’m not aware that you’ve been ill or that you’re experiencing some kind of crisis – maybe you are. If so, I sure wish you would let me know. In your hardest times you need to draw closer to God and allow others to lighten the load of your burden rather than withdraw. However, it seems from your Facebook posts that most of the time you’re simply busy chasing other things. I used to think when you would disappear for weeks at a time that maybe I had done something or said something to upset you. But I’ve learned over time that kind of thinking has mostly been my own insecurity. My conscience is clear. But if I have done something, then in a spirit of Christian love, I beg you to talk to me. As a younger pastor I used to feel irritation when you were absent. Your lack of commitment frustrated me. But now my feelings have turned more to grief because I’ve come to realize your absence is not really about me. It’s about you and what you are foolishly trading to keep up with this world. It’s about what truly captures your heart and what you value most. I see your beautiful children whom you love with all your heart. Yet you’re setting them up to care little for God’s church. One activity after another displaces any real commitment to the Lord’s Day. I understand that everyone occasional has something special that comes up, takes a vacation or a trip to visit family. But this is different. You cram your family with so much activity revolving around the kids that devotion to God is consistently squeezed out. Your kids are learning that church is something the family does only when they have one of those rare Sundays off from the activities. And even then, because everyone is so ragged out, on some Sundays you just can’t get out of bed. This letter is not to fuss or to shame. I want you to know that my heart is jealous for your devotion to God. I just feel that something is wrong. How can you say to know and love Christ, yet find worship and participating in ministry so unimportant? How can you claim to be His, yet have such little desire for spiritual growth and discipleship? Please understand these are not so much criticisms as genuine questions that give me great concern for the well-being of your soul. You know that I’ve preached to you the grace of God. Your church membership, giving, attendance, and service don’t earn you favor with God. It’s all about faith. But I’ve also repeated over and over that real faith is always a faith that follows. God’s Word teaches us that a genuine believer bears the fruit of the Holy Spirit in his life. I know you’ve heard that at least a few times. I’ll never rant in the pulpit about your absenteeism. I’m always going to preach to the ones who are present. But I want you to know how much I care about you. I want you to understand that my greatest joy would be to see you love God and His church, and to observe you growing in Christ. No matter what is going on in your life, I’m always your friend. But it’s part of my calling to tell you when things aren’t right. You’re part of the flock God has entrusted to me, and every sheep is precious. You’re not just a number. God loves you, and so do I. He has already loved you in Christ with a love that needs no further demonstration. He’s given you everything in Christ. How I pray that you will wake up to how great His love is for you, and how that should shake up and reshape the life you now live. I pray that if you truly know Christ, that you’ll come to your senses like the prodigal son and run home to your Heavenly Father who stands with open arms. Until then, I will still be praying for you and possibly sticking my nose in your business. After all, I’m your pastor. A full pendulum swing back to the right has put the Republican Party in a position in Kentucky that has led quickly to the passing of abortion-curbing legislation that in previous decades had absolutely no chance. At least for the moment, abortion providers are not allowed to perform abortions on unborn babies over 20 weeks, and women seeking an abortion must be given an ultrasound before an abortion procedure can take place. This success of conservative, pro-life politicians and their constituents will most definitely be challenged in the courts. It took only one day for the ACLU to bring suit! It is conceivable that such legislation may move the Supreme Court ultimately to revisit Roe v. Wade. Of course, we are still waiting to see what nominee to the court president-elect Trump will put forward. Furthermore, we may see additional nominations to SCOTUS during the next four years. A tide that favors the pro-life cause has without a doubt arisen. The question remains as to how high it may carry legislation in state houses until it begins to recede because of federal courts. The push to make abortion legal in our country happened on the heels of the feminist movement, which was by and large part of the so-called sexual revolution. As the society moved to more open liberal views in regards to sexuality in the 60s and 70s, unwanted pregnancies began to be rethought as well. Why should a woman who found herself pregnant necessarily have to carry and give birth? Some were getting illegal and dangerous abortion anyway. So, the arguments for legalized abortion began to emerge in force. In these arguments the pregnant woman's rights and the issue of safety took center stage. What people had intuitively known - that an unborn baby was a human life - was suppressed and took a backseat to a woman's choice. 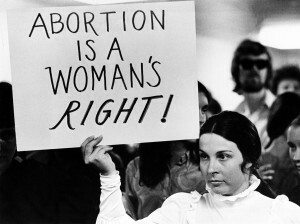 The argument that ultimately won the day, resulting in legalized abortion, concerned a woman's right to privacy in regards to her pregnancy. The Supreme Court applied the fourteenth amendment to the debate in Roe v. Wade. No serious discussion took place about the nature of the unborn themselves. These old arguments are going to resurface for a new generation. However, there will be one difference - technology. Ultrasound technology was new, of poor quality, and not widely used in the United States in 1973. The in utero detail we can see now of a baby is amazing! The equipment and skill we now possess to help premature babies survive has also complicated the issue. It seems much more likely that when the lawyers and judges begin to argue and rule on this in the days ahead, there will be a lot of new material to work from that was unavailable the first time around in the 60s and 70s. We might actually be forced to have the discussion that never took place from the first. Yes, we must talk about women's health in regards to pregnancy. But we must also talk about the reality of this new life. We must talk about whether this new life has human rights, just like the mother. Our country, through its legislative and judicial processes, will have to rethink our understanding of life and freedom. We will have to sift out the weightier ethical elements and prioritize. In the end maybe we will come to our senses and finally admit what I believe we all really know - that an unborn baby is a human life. Then we will have to decide if that unborn human life has just as much the right to life as a newborn human life. I believe we are now on a trajectory in which these discussions will be taking place at the family dinner table, at the coffee shops, on social media (God help us! ), in churches, on the cable news networks, and among our leaders. In the end, decisions will have to be made. Will we continue to hide behind the rhetoric of choice and become even more callous and selfish? Or, will we repent, admit our error, and begin to reshape a culture that will uphold the dignity of every person and protect the most vulnerable, while being serious about helping women who find themselves with unplanned and unwanted pregnancies? I have a feeling that we may get some answers to these questions in 2017.